SET OF 12! ORGANIZE YOUR PENNIES IN A 'MOO' FILLED BANKS! A great resource for saving and spending on any super sale. 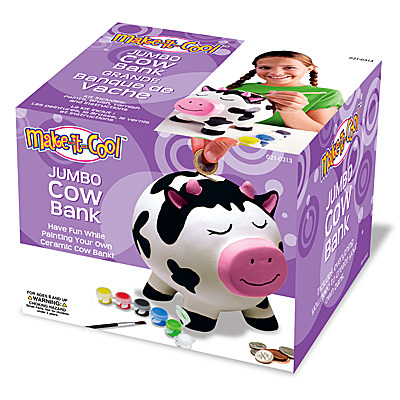 Design a Jumbo Cow Bank according to your mood for the day. This jumbo chunky cool cow pottery bank is ready to decorate and display! Each bank has a rubber stopper making it easy to remove coins, is box packaged and contains decorative suggestions to personalize for showers, birthdays, graduations and for newborns. Imagine what you can do! Decorate with painty markers, glass paint or stencils. Also use stickers, rub- ons, ribbon, rhinestones, beads and buttons. Easy place to save for any special fund, electronics, podcasting, dirt bike. Fun project for boys and girls. Available in Cow and Pig styles. Included everything needed to paint one bank. Contents: One ceramic bank , 6 non- toxic paint pots, varnish for sealing, one brush, Approximate finished size: 4.5" x 5' x 5.5" (11,43 x 12,7 x 13,97 cm). Paint colors may vary from those illustrated. Conforms to ASTDM D- 4236/Conforms to ASTDM S-4236 & F-963 (USA) and EN71 (Europe). Recommended for ages 5 and up.